Stacie McCracken & Jody Harper (of Have Your Cake & Eat It Too) received a Gold Key award. Scott Reeves accepted the Gold Key award on behalf of Quik-Trip. Darren Hyatt received a Gold Key award for his new Hyatt Appliance building. President Teresa Brown, Vice-President Christa Lambert, President-Elect Scott Reeves, and Secretary/Tresurer Cynthia Reed. Teresa Brown (of the American Bank of Oklahoma) will help steer the 2014 Chamber. The first award presented by outgoing Chamber President Susan Babbitt (left) was the Member of The Year award to Bev and Harry Lossing (of McDonalds). The award is voted by chamber members. Senator Rick Brinkley and Chamber President Teresa Brown assisted with the awards. 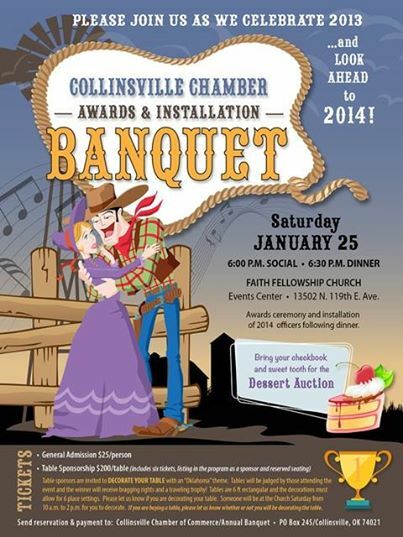 The Collinsville Family Pharmacy was one of the many table sponsors that decorated their table in the western theme of the night. Too Blonde Salon / Simply Lylas won the table decorating contest. A desert auction (run by the folks from The Feed Store & Collinsville Livestock Exchange) raised an estimated $9000 from banquet attendees to boost the Chamber of Commerce budget. Collinsville School's Library Media Specialist were presented with "Education Awards". (L-R): Lynn Gowler (High School), Karen Rowden (Middle School), Debbie Wolfe (Wilson Elem. ), Angela Means (ECC), and Amy Gregory (Herald Elem.). Jessi & Michael Moreno (of Bigfoot Prints Screen Printing & Embroidery) received one of the Gold Key awards for their investment in Collinsville. Gidget Centeno-Campeau & Robbe Campeau (of Simply LYLAS) received a Gold Key award. Musical entertainment was provided by the CHS Honor Esemble. CHS Honor Society students served the (Three Sisters) meal.